A unique beaded bracelet is an ideal way to demonstrate your individuality and personality. A bracelet is a very special form of jewelry. The fact that it is worn on the wrist gives the ultimate amount of flexibility. A bracelet can be worn subtly tucked under the sleeve of a formal jacket or with flamboyant style dressed with a short sleeved t-shirt or top. The flexible nature of bracelets lends itself to beads. The huge variety of beads available range from tiny seed beads to large feature beads. This number of styles, combined with the wide range of ways that they can be used -- from macrame to bead weaving -- means that there is bound to be a beaded bracelet to suit any occasion. Unique bracelets can be bought as 'one of a kind' from jewelers, made to order, or perhaps an existing bracelets can be adapted and customized. Beaded bracelets are often one of a kind and therefore are totally unique. There are other ways of customizing a bracelet and making it totally different. Charms: Adding a few charms can totally alter the overall effect of a beaded bracelet. These can transform a plain, simple bracelet into something completely stunning. Charms can represent a number of things and are special keepsakes of a special occasion. Fastener or Clasp: By simply changing the clasp of a beaded bracelet a whole new look can be achieved. There are some fantastic clasps available; heart locks, jumbo bolt rings or simple loop and hook clasps are both glamorous and practical. 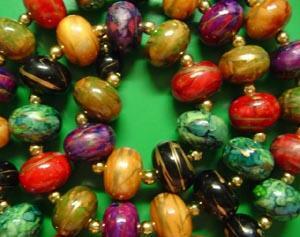 Reforming Old Bracelets: Old or broken bead bracelets can be reformed by a jeweler or bead artist into a new bracelet. This is a unique way to give a retired, yet special bracelet a new lease of life. The whole bracelet could be reformed or components could be added to other beads to create something new. When deciding what style of original bead bracelet to buy there are some key features to consider. These are important to ensure that the perfect item is found. A badly fitting bracelet, one with poor quality beads or one that is not quite the right style will end up as a bad investment, just sat at the back of the jewelry box for years to come!When buying a bracelet the style is important. This will partially be determined by whether the bracelet is for everyday wear or for special occasions. Precious Metal Beads: Gold and silver beads can look stunning in a bracelet. They are hard wearing and are available in a variety of shapes and sizes. Gemstones: Many gemstones are extremely solid and robust, meaning that they are suitable for everyday wear. Some gemstones such as turquoise are slightly more fragile and may fracture with a sharp knock. Lampworked Glass Beads: These are beads that have been formed by hand and often have unusual shapes and styles. These are great for occasional wear and do offer something entirely different. Fragile Beads: Beads such as pearl, some gemstones and silver or gold plated beads may get damaged with continual wear, however are a wonderful addition to a occasional wear bracelet. Here are some tips to help you to buy your perfect beaded bracelet. Don't be worried about asking the jeweler to customize a piece or create something special for you. Many jewelers will welcome the challenge. Set a budget before starting - this will save disappointment later! Note any special cleaning or after care requirements to ensure the bracelet stays looking wonderful for years to come. A unique beaded bracelet can be dressed up or down and will soon become a favorite item of jewelry.